The total number of trademark cases adjudicated by the TRAB has grown since 2015 (108,900 cases), with an increase of 34.9% in 2017 (168,900 cases) compared with 2016 (125,200 cases). The percentage of decisions challenged before the courts was 7% in 2015. This dropped to 4.27% in 2016 before increasing to approximately 5% in 2017. 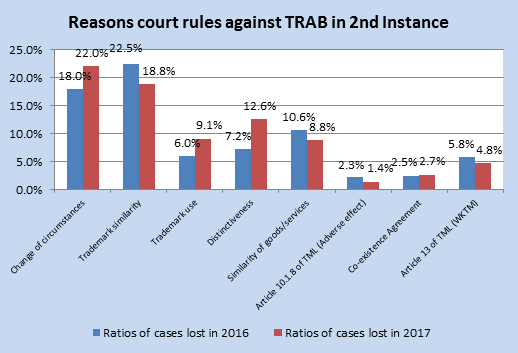 In 2017 25.2% of the TRAB's decisions challenged at first instance were overruled by the Beijing IP Court and 37.4% of the cases appealed before the Beijing High court were overruled. Finally, of the 165 retrial verdicts received, the Supreme People's Court overruled the TRAB's decision in 54 cases (32.7%). 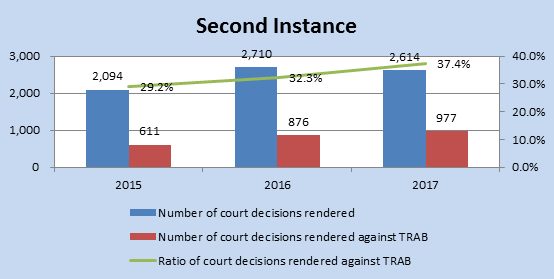 In its analysis, the TRAB observed that the ratio of court decisions rendered against its own adjudications in the first instance and on appeal has increased each year. 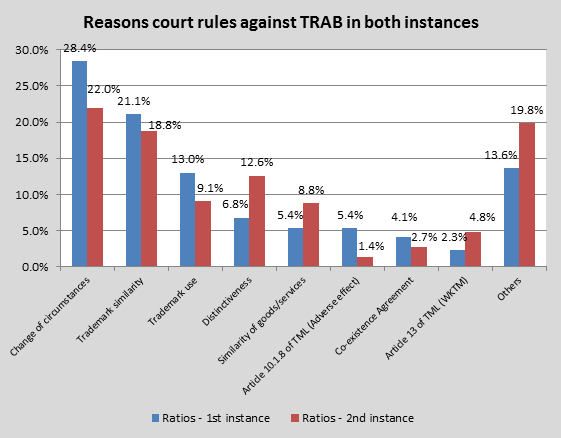 The ratio of court decisions rendered against the TRAB in the second instance is higher than that in the first instance. The TRAB's breakdown of the reasons why it lost cases in administrative litigation in 2017 is set out below. other circumstances concerning the application of substantive clauses. 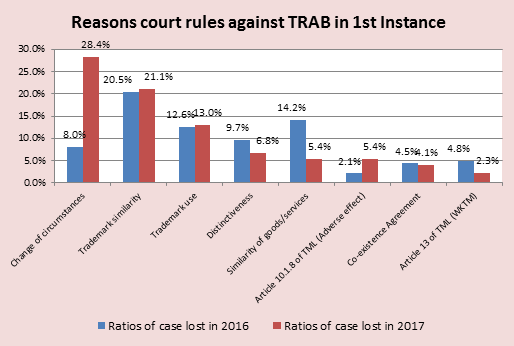 The TRAB also provided a comparison of the reasons why it lost cases in the first and second instances in 2016 and 2017. The TRAB noted that a change of circumstances is one of the major reasons why its decisions are overruled by the courts in both instances, as indicated in Figures 4 and 5 above. 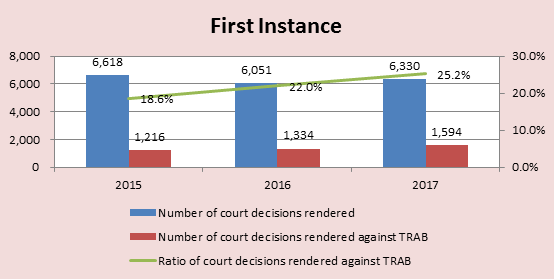 In 2016 the first-instance cases in which TRAB decisions were overturned due to a change of circumstances accounted for 8% of the total case load. This percentage increased sharply to 28.4% in 2017, as shown in Figure 4. The TRAB stated that a 'change of circumstances' corresponds to cases in which the China Trademark Office (CTMO) refuses an applied-for mark because of a cited prior mark and the applicant files a review of refusal with the TRAB (while initiating the procedure necessary to eliminate the cited obstacle mark). an application has been filed to modify the trademark application or registration or renew or assign the cited mark. Applicants should conduct a meticulous trademark search before filing their trademark applications. The courts prioritise efficiency and do not suspend their decisions pending the affirmation of a cited mark's invalidity. Once the invalidity of a cited mark has been ascertained, the court may adopt the change of circumstances principle to approve the registration. a conflict between a prior trademark and an applied-for trademark to be resolved as soon as possible in one single procedure. In its analysis, the TRAB stated that where the courts overrule its decisions on issues such as trademark similarity, similarity of goods or services, distinctiveness or trademark use, they often do so on the basis of new evidence submitted during the court proceedings. The TRAB raised concerns over such practice, as it lowers the efficiency of trademark administrative procedures and results in increased administrative lawsuits and judicial resources being wasted. The TRAB therefore called on the judiciary to set proper limits around admitting new evidence in litigation procedures or penalise parties that fail to meet their burden of proof. The TRAB explicitly advised the courts to adopt the approach set out in Articles 101(1) and 102(2) of the Interpretation of the Supreme People's Court Concerning the Application of the Civil Procedure Law of the People's Republic of China in ascertaining the admissibility of evidence adduced on the expiry of statutory time limits and the penalties merited by a failure to meet the burden of proof. It may be difficult to determine whether a litigant abstained, on purpose, to adduce evidence in its own interest. The court's tolerance is therefore understandable. However, this depends on the circumstances. In cases concerning the cancellation of a trademark for non-use, the rules should be strict: if a trademark owner does not adduce any evidence of use at the initial stage of the procedure (some flexibility regarding the length of time to collect evidence can be allowed), the trademark should no longer be cited as an obstacle for the registration of a later trademark or the opposition or any other procedure initiated by such trademark should be dismissed. In its analysis, the TRAB stated that without explicit provisions in the Trademark Law, it has become an acknowledged understanding that trademark coexistence agreements should be taken into account when assessing trademark similarity. However, the TRAB admitted that the extent to which such an agreement should influence a similarity assessment remains controversial. The acceptance of trademark coexistence agreements in judicial practice has increased significantly following the 2016 Supreme People's Court precedent set out in Nexus. (3) In 2017 the TRAB lost 91 cases due to coexistence agreements reached between the parties concerned during court proceedings. Nevertheless, the TRAB reiterated that although the conclusion of a trademark coexistence agreement may reduce the likelihood of confusion, it does not necessarily replace the examination of the likelihood of confusion and make the later trademark registrable. The TRAB has held that a prior trademark owner is not entitled to make a declaration of will in consenting to the registration of another trademark. Instead, such owner, in its own interest, may waive its claim against the registration of such other trademark. However, this waiver of its claim will not necessarily lead to the elimination of confusion. The authorities must assess the likelihood of confusion between trademarks. The parties concerned may submit trademark coexistence agreements to convince the authorities that based on the agreed terms, the coexistence and use of the trademarks will not cause confusion among consumers. The authorities will then decide on the merit of the coexistence agreement and other relevant factors. However, where two marks and the goods or services thereof are identical or almost identical, the mere submission of a trademark coexistence agreement proving the prior trademark owner's waiver of its claim against a later mark does not rule out the possibility of confusion. This issue will no doubt be actively discussed in the course of the Trademark Law's revision. The key issue here concerns the nature of the trademark right. In other jurisdictions, such as the European Union, the registration of a trademark does not constitute the granting by the authorities of a right to use. Rather, a registration confers on the registrant only the right to prevent others from using the trademark. The registrant is therefore entirely responsible for the enforcement or non-enforcement of such right, which is considered to be essentially private. Hence, there is no limitation to coexistence agreements, as the authorities consider that trademark owners are the best judges of their own business interests, which correspond with the public interest in avoiding confusion. For further information on this topic please contact Paul Ranjard or Nan Jiang at Wanhuida Peksung by telephone (+86 10 6892 1000) or email (ranjard@wanhuida.com or jiangnan@wanhuida.com). The Wanhuida Peksung website can be accessed at www.wanhuida.com and www.peksung.com. Where a party provides any evidence beyond the time limit, the people's court shall order the party to provide an explanation, and may request the party to provide corresponding evidence, if necessary. Where a party provides evidence beyond the time limit for objective reasons or the opposite party does not raise any objection against the evidence provided beyond the time limit, it shall not be deemed overdue. Evidence provided by a party beyond the time limit deliberately or due to gross negligence shall be deemed inadmissible by a people's court. But the evidence which is related to the basic facts of the case shall be deemed admissible by the people's court which shall impose an admonition or a fine in accordance with the provisions of Article 65 and paragraph 1, Article 115 of the Civil Procedure Law. Evidence provided by a party beyond the time limit not deliberately or due to gross negligence shall be deemed admissible by a people's court which shall impose an admonition on the party. Where a party requests the opposite party to compensate for costs of transportation, accommodation, meals, lost labor, witness presenting at court, and other necessary expenses arising from overdue provision of evidence, a people's court may be supportive. (3) On 23 December 2016 the SPC found, in the retrial on the review of refusal of the NEXUS mark, that the trademark coexistence agreement that Google had entered into with the registrant of the cited mark NEXUS was admissible and that the applied-for trademark NEXUS, which was designated to be used on "handheld computers and portable computers" was not similar to the cited mark NEXUS, which was used on "computers used on bicycles".